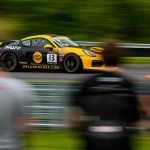 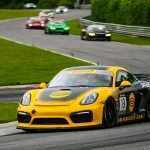 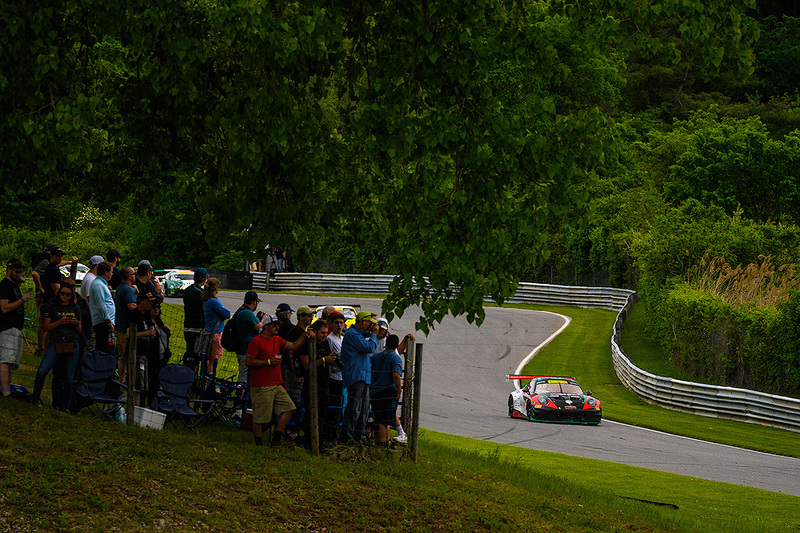 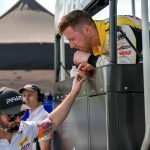 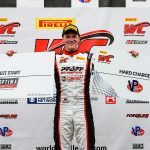 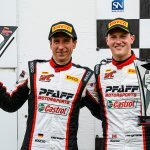 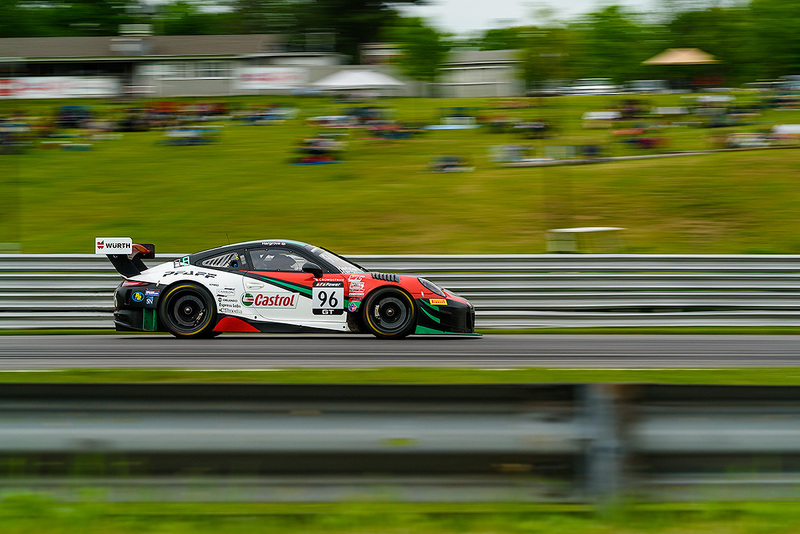 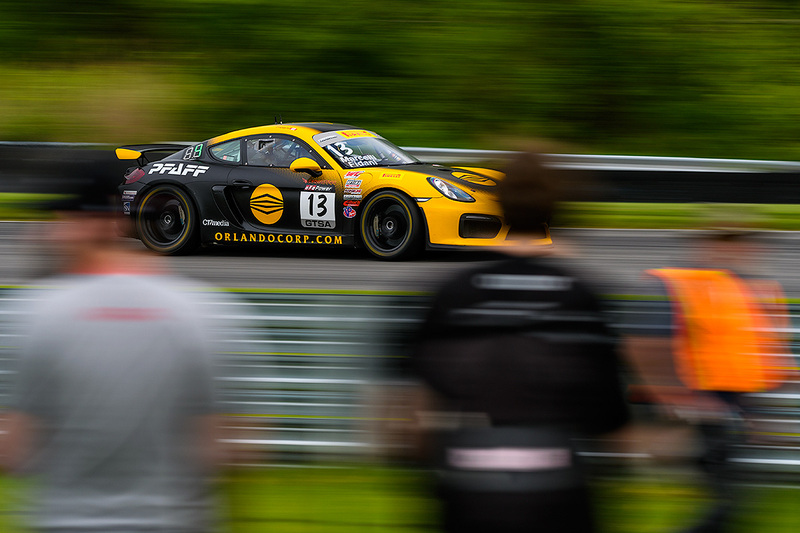 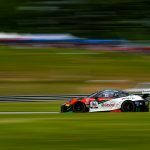 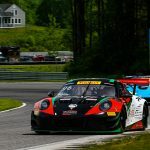 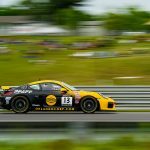 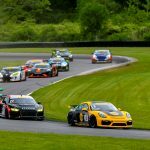 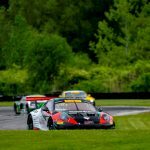 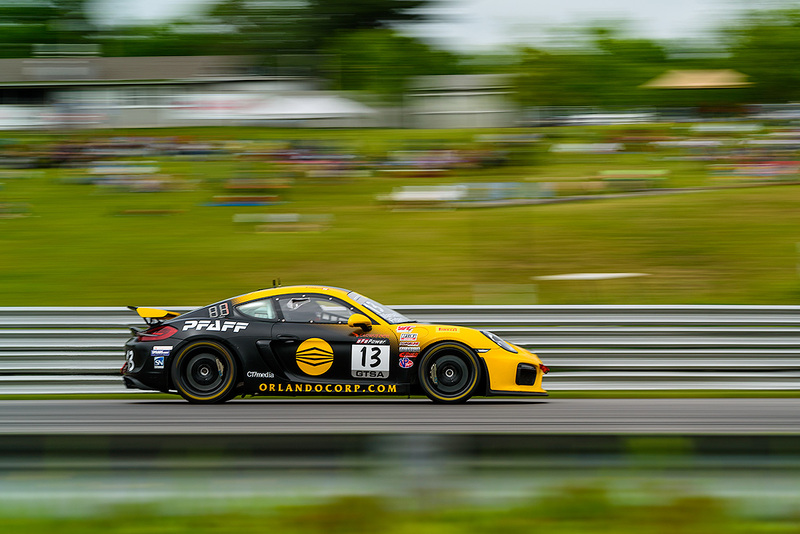 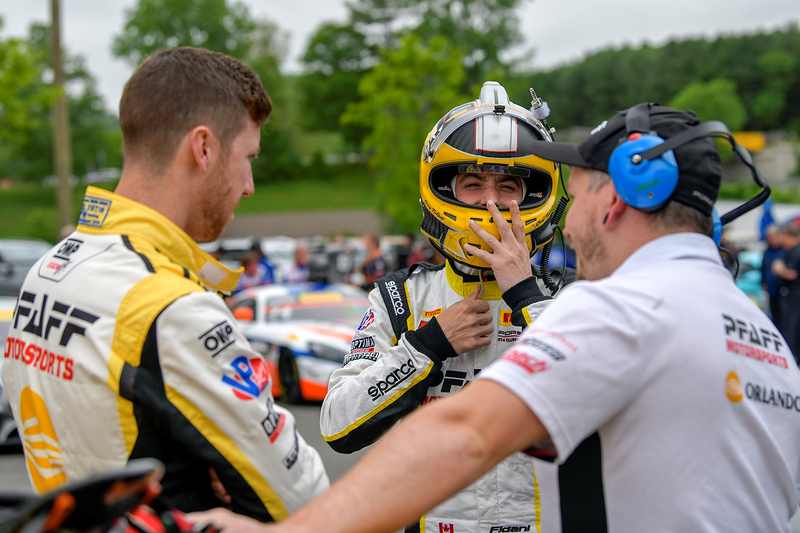 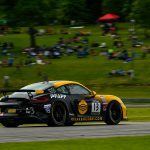 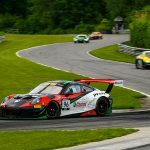 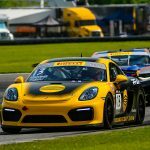 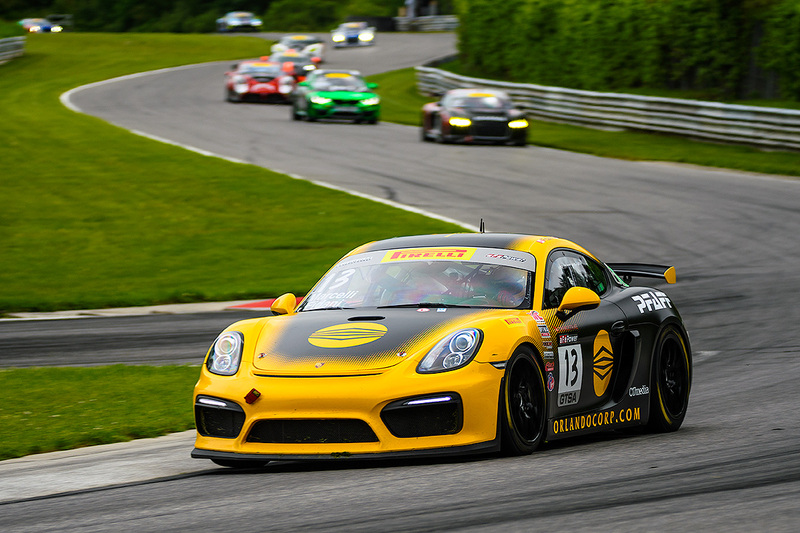 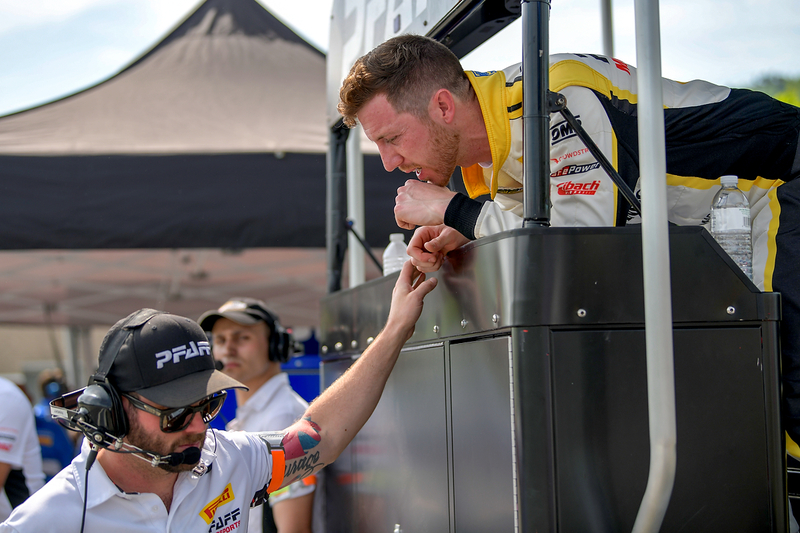 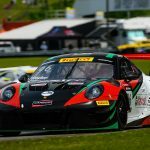 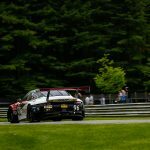 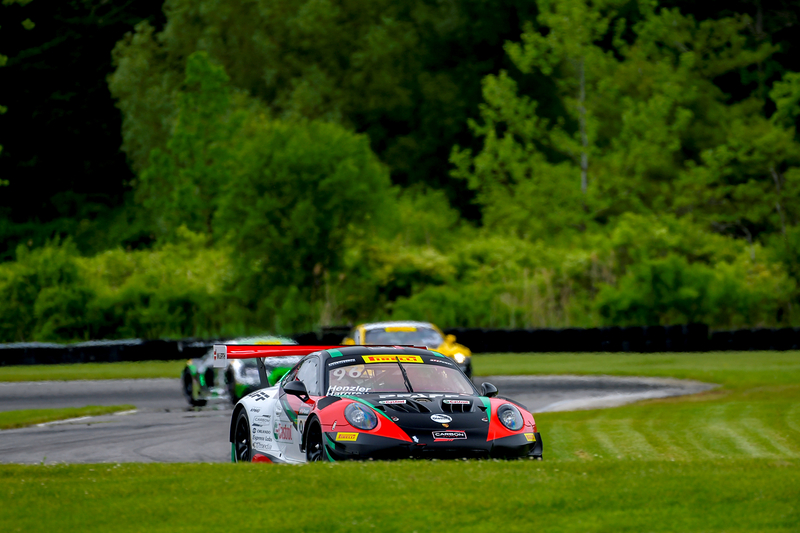 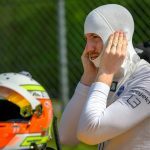 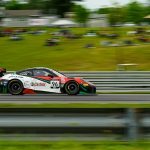 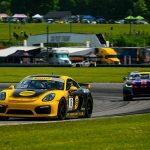 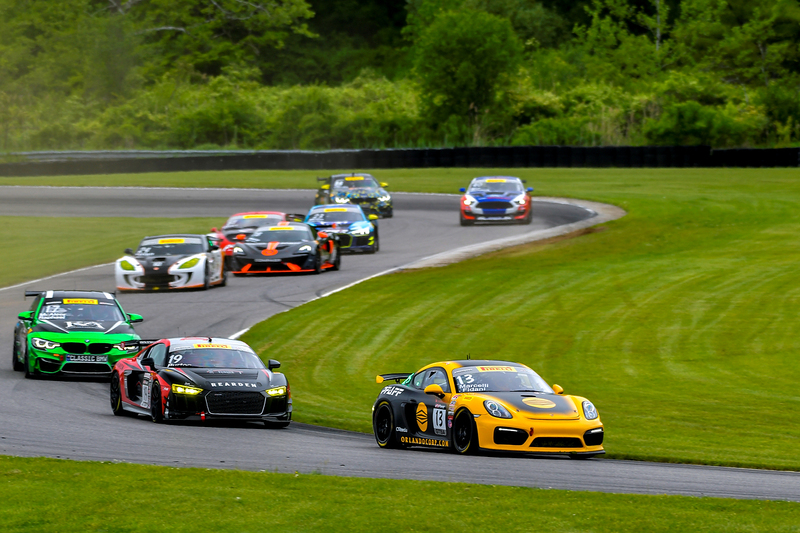 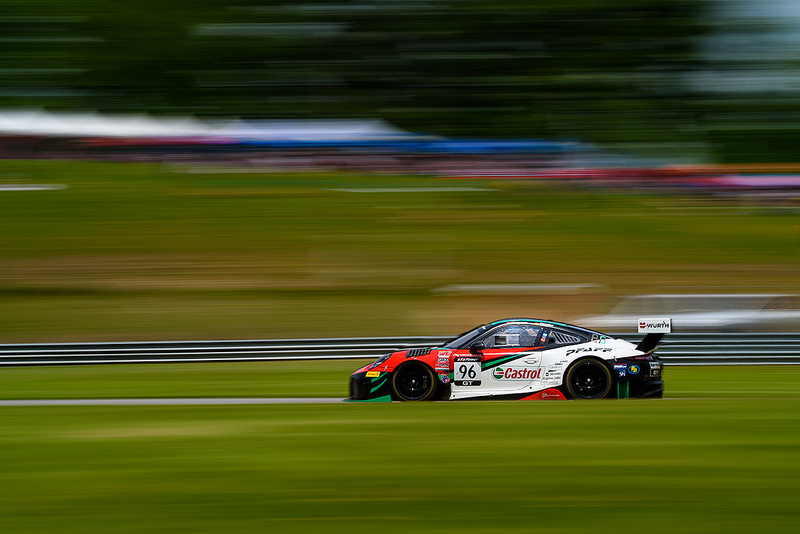 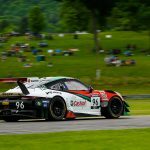 The Pirelli World Challenge SprintX championship stopped at Connecticut’s Lime Rock Park during the Memorial Day long weekend. 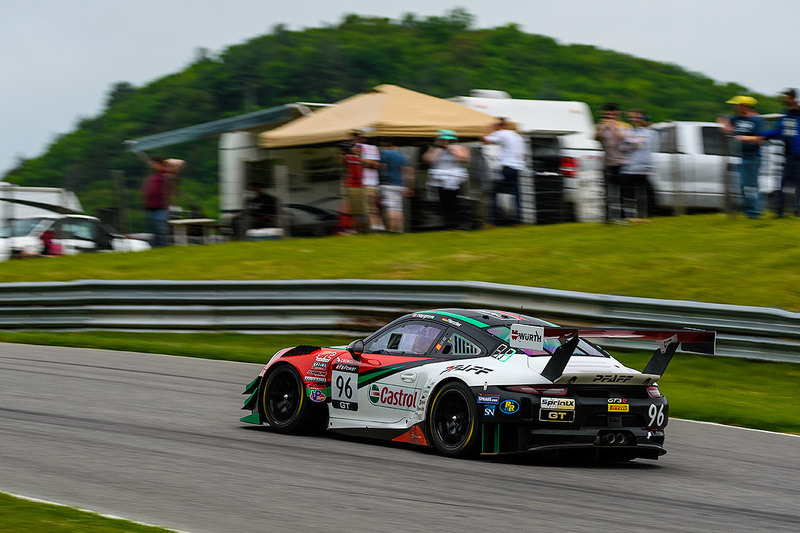 The SprintX championship puts the emphasis on teamwork, with hour-long races featuring a mandatory driver change. 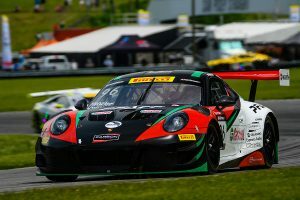 Once again Scott Hargrove, driving the #96 Castrol/Pfaff Motorsports Porsche 911 GT3R, was paired with Porsche factory driver Wolf Henzler, while Orey Fidani in the #13 Orlando Corporation/Pfaff Motorsports Porsche Cayman GT4 Clubsport MR, was paired with Kyle Marcelli. 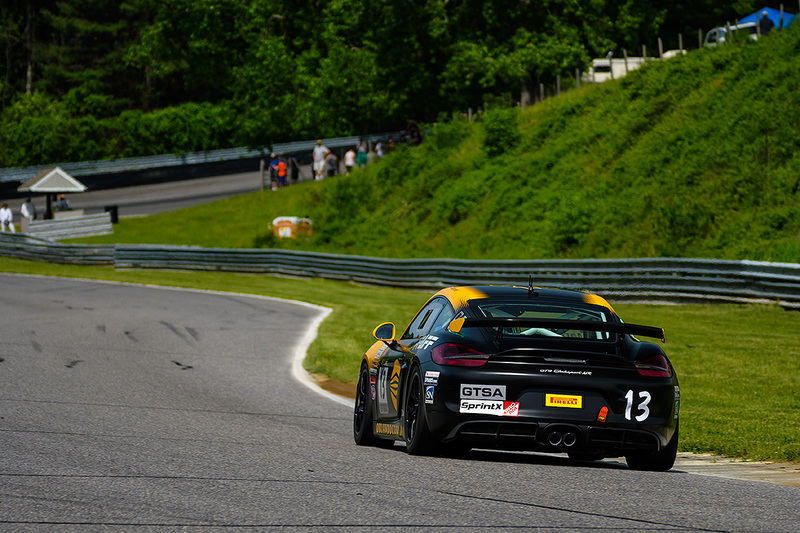 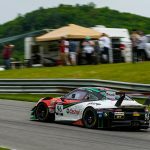 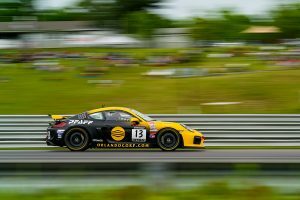 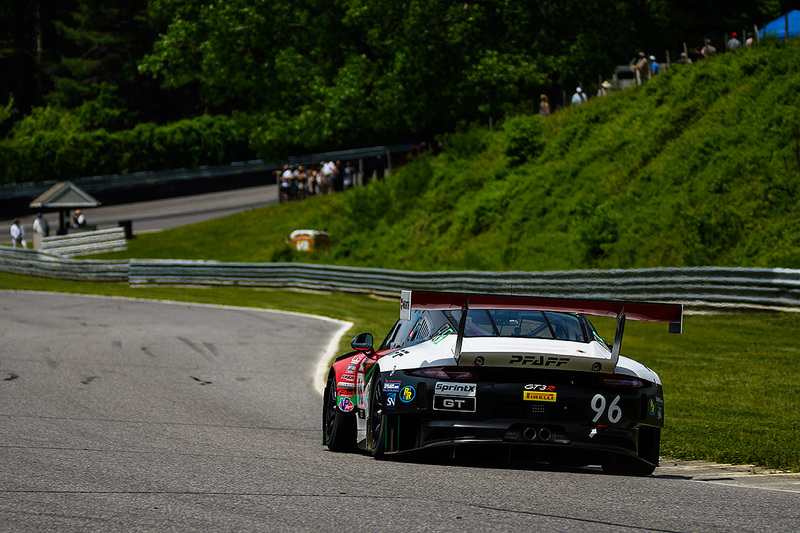 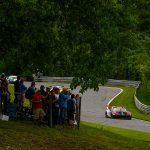 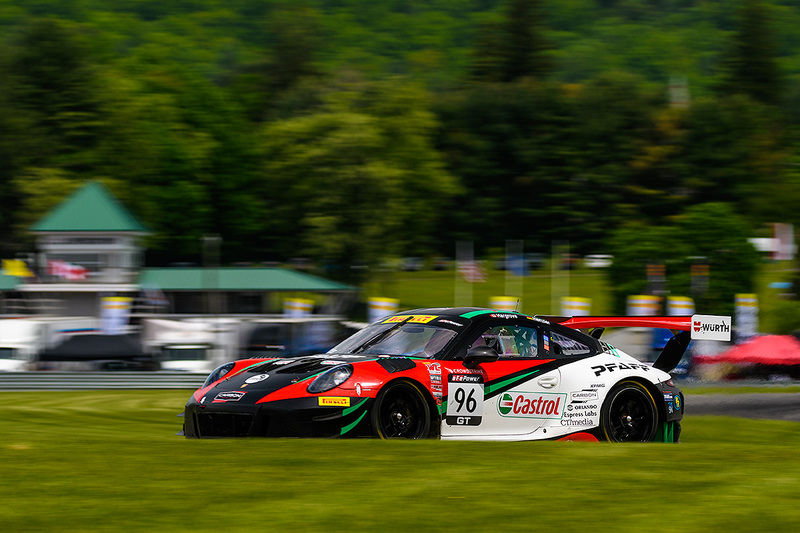 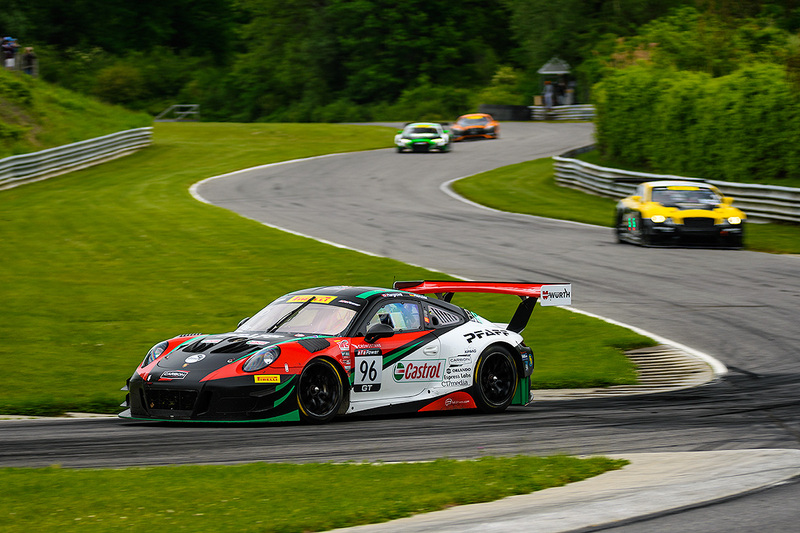 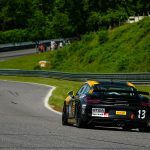 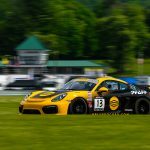 The challenging, bumpy Lime Rock is not a track favourable to the Porsches, as its short lap features many long straights that favour more powerful competitors. 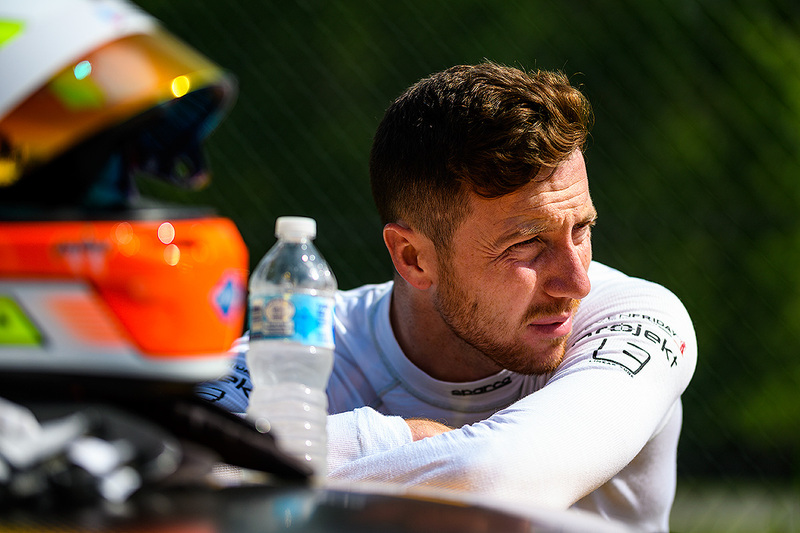 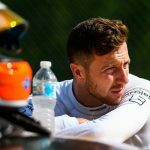 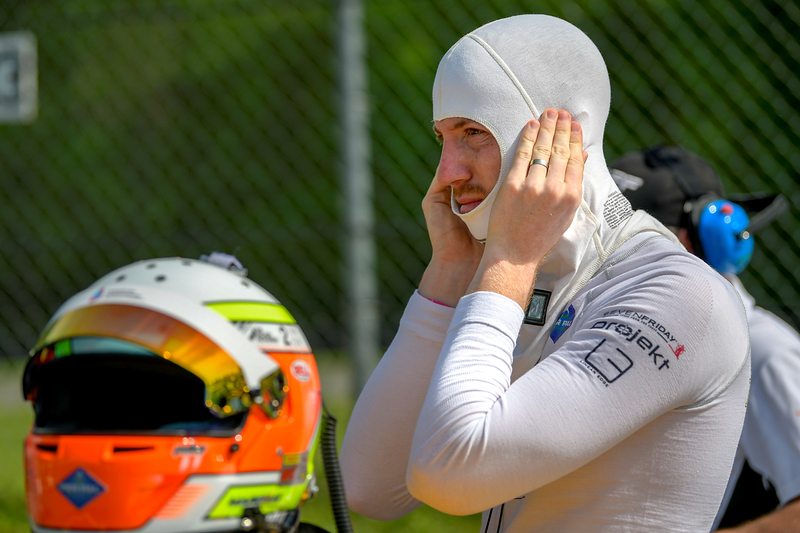 In qualifying on Saturday, Hargrove and Henzler qualified sixth – subsequently raised to fifth due to a penalty for another team – and Fidani and Marcelli qualified 25th overall for their first race. 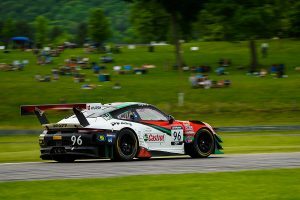 Due to the Memorial Day weekend, and the consequent running of the Indy 500 on Saturday, all of the PWC races were condensed into one action-packed day on the holiday Monday, putting the emphasis on the cars’ consistency and reliability, as well as the drivers’ ability to avoid mistakes. 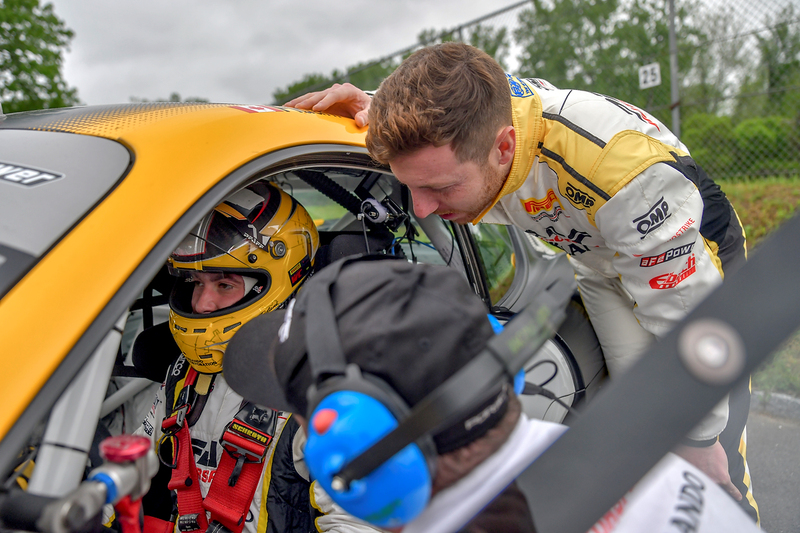 In their first race, Fidani and Marcelli managed to avoid collisions and off-track excursions that happened throughout the field and jumped to 11th overall and seventh in class, a very solid finish for a rookie driver pairing in the series. 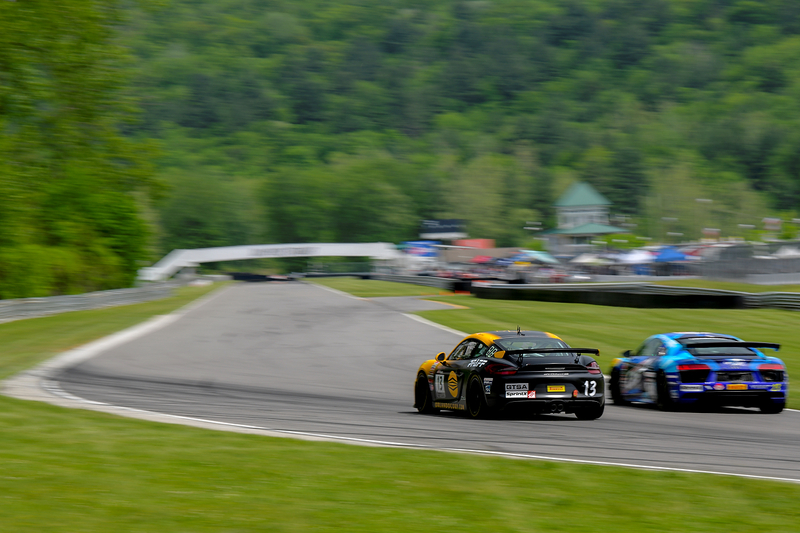 In their second race of the day, they drove similarly well, finishing eighth in class. 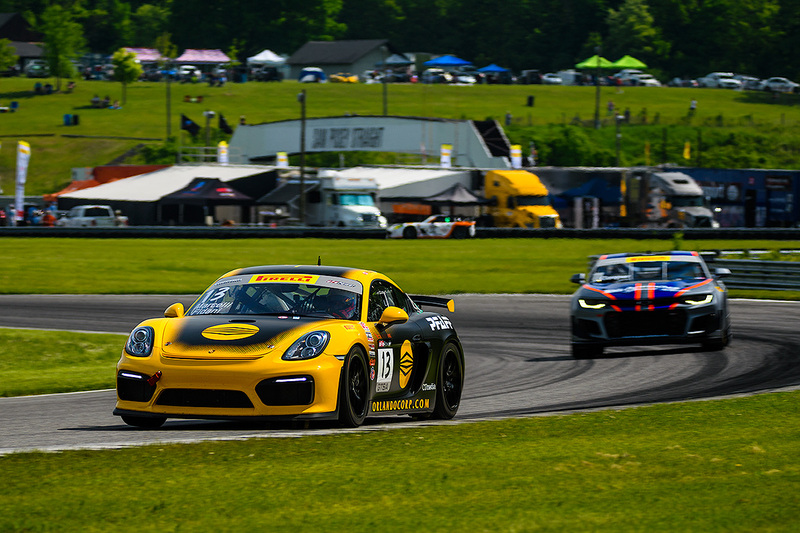 Hargrove and Henzler, starting fifth in a smaller field, had to work hard in race one to make up ground, but an extremely smooth and fast driver change, combined with their flawless driving, had them finish race one in third. 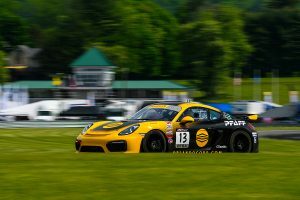 With the starting grid for race two set by fastest laps in race one, the pair had to drive exceptionally well from their 10th-place starting position to finish fourth overall. 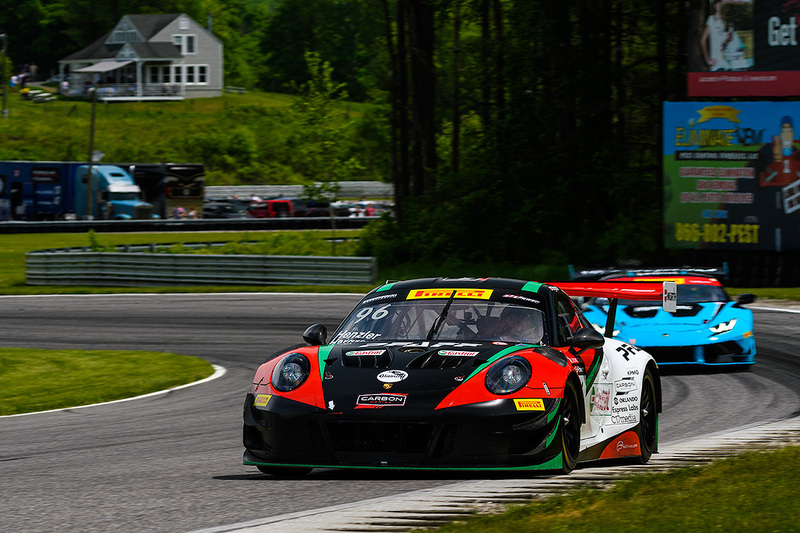 The pair now find themselves second in the SprintX points race, just two points behind the leading pair of Toni Vilander and Miguel Molina. 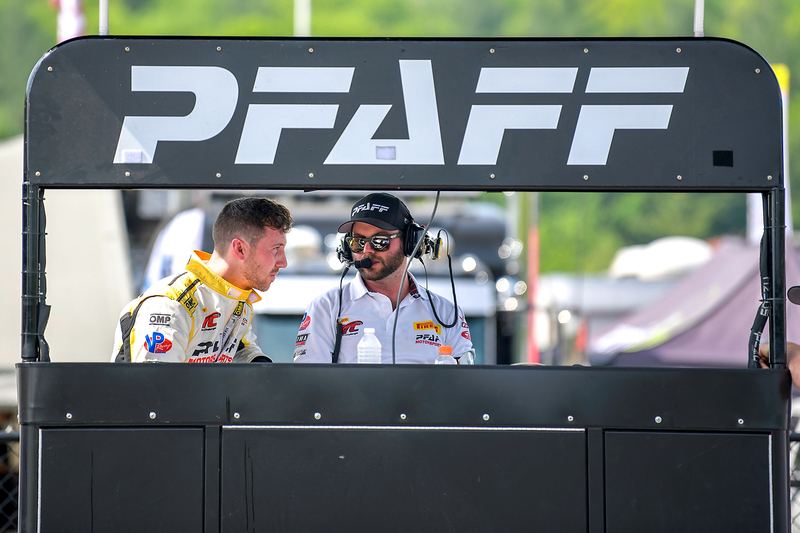 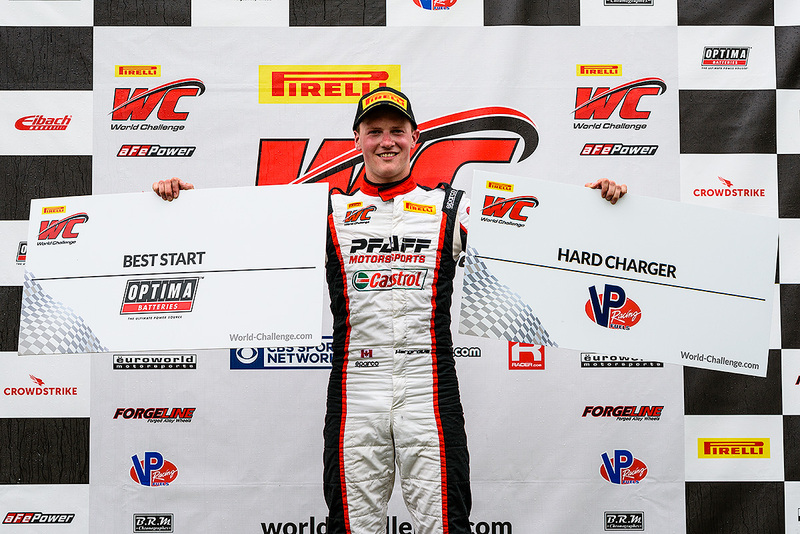 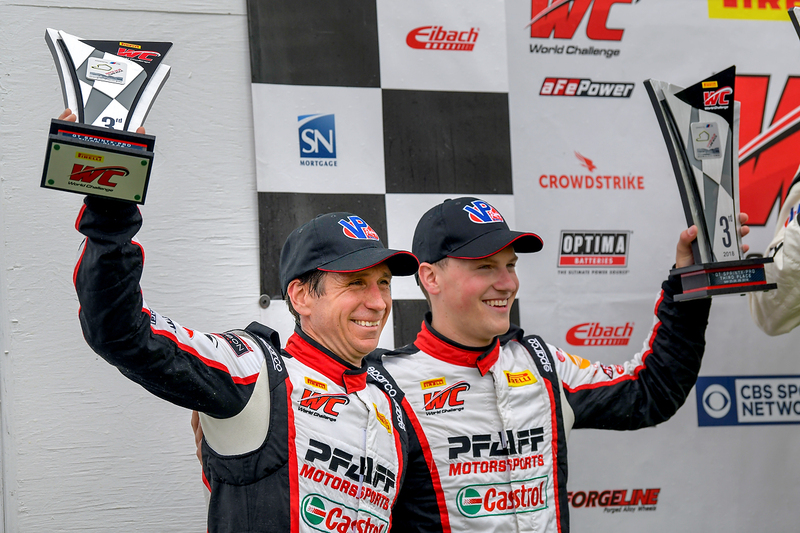 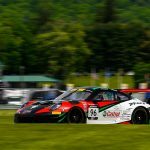 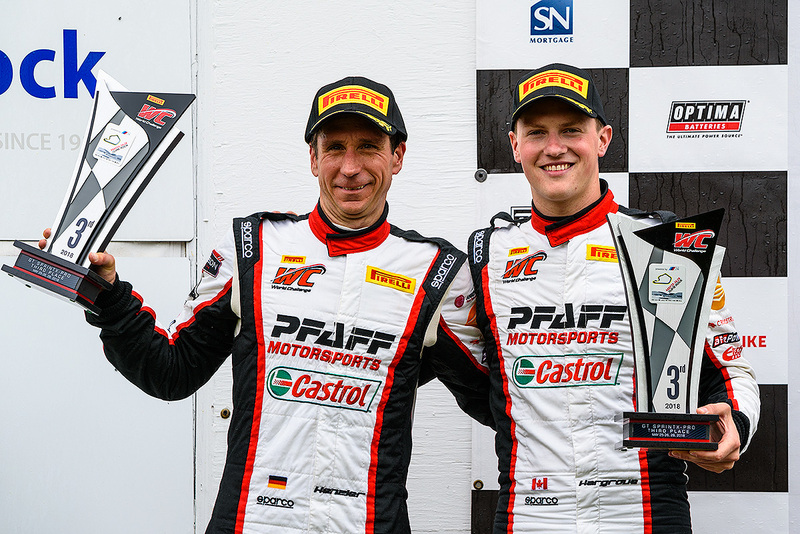 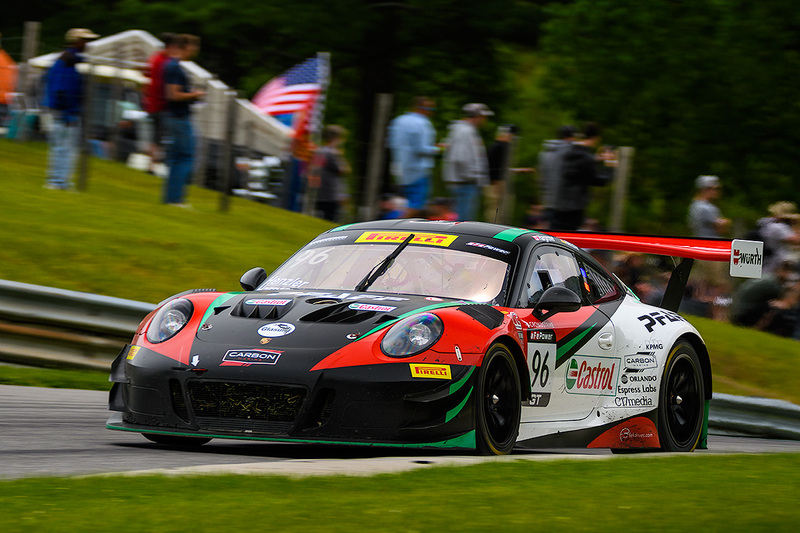 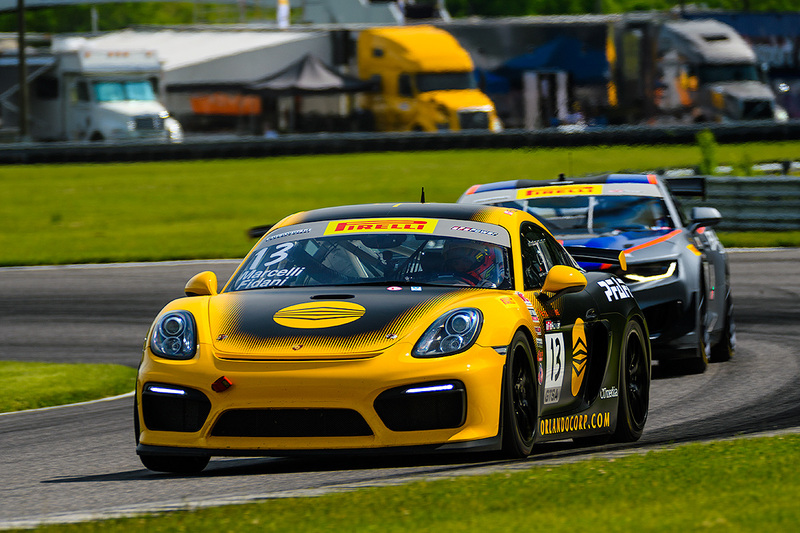 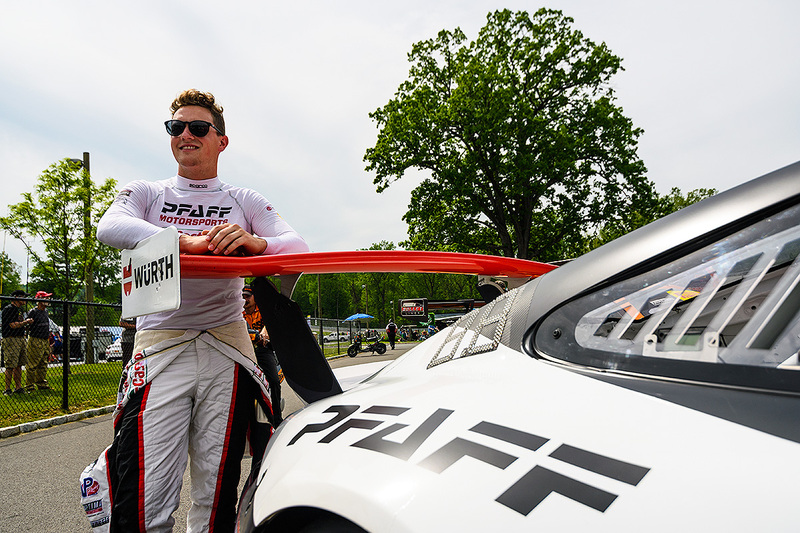 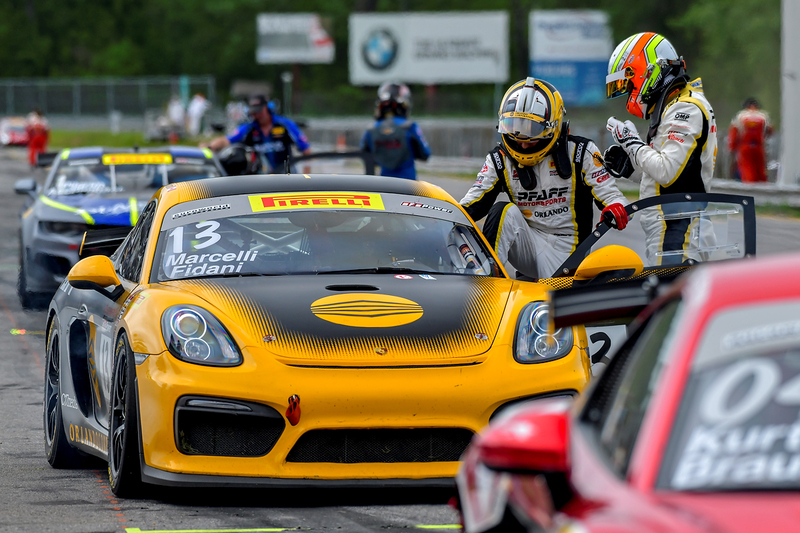 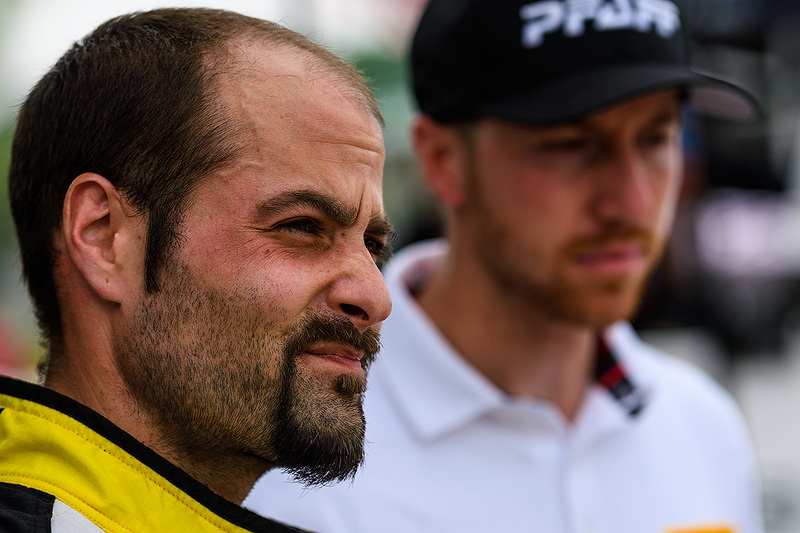 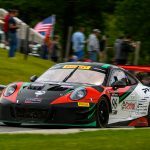 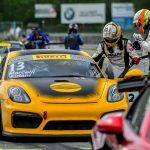 Pfaff Motorsports continues to lead the team championship in the PWC GT class. 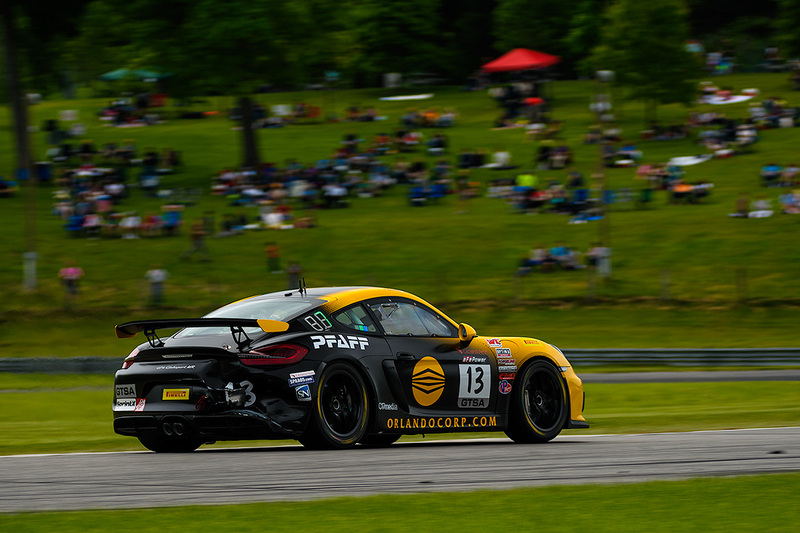 Next stop on the Pirelli World Challenge schedule is the legendary, high-speed Road America course after a three-week summer break. 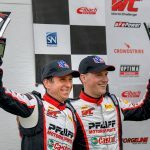 Follow along at world-challenge.com and pfaffmotorsports.com.